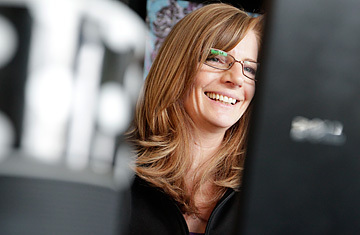 Jane Good, a teacher with 21st Century Virtual Academy, works from her home in Thornton, Colo. on Jan. 11, 2012. Computer-Led Classes: Teachers of the Future? Teacher Jane Good hurries around her kitchen on a recent morning in her Denver suburb, preparing breakfast in what will serve as her work attire for the day: black exercise pants, a black, long-sleeved running shirt and white slipper booties. "This is one of the perks of being an online teacher," Good says as she flips a fried egg and removes quinoa and poblano peppers from the microwave. Good, 46, is one of 11 full-time teachers in Colorado's three-year-old 21st Century Virtual Academy, an online school of about 750 students that is part of the state's largest school district, the JeffCo Public Schools. She teaches a mix of full-time and part-time students in seventh- and eighth-grade science, ninth-grade Earth science and 10th-grade biology  all from the comfort of her home office, which has stunning views of the Rockies. Good makes around $63,000 a year, the same amount she'd earn in a brick-and-mortar school in her district. Scant research exists on the effectiveness of full-time online learning, but 30 states allow K-12 students to learn entirely online from teachers like Good, who has about 125 students, some 50 of whom are full-time. Across the country, more than two million K-12 students participate in some form of online education, and nearly 300,000 do so full time, according to John Watson, founder of the Evergreen Education Group, a consulting firm in Durango, Colo.
Online education has its origins in a movement in the late 1990s to bring specialized and Advanced Placement classes to rural areas whose districts couldn't otherwise provide them. Since then, shrinking school budgets have opened the door to companies that offer a range of online alternatives for special-needs students and parents dissatisfied with available options. Steady growth has meant there's a pressing need for virtual teachers, some of whom never set foot in a classroom. They are a new breed, these teachers who work remotely, and they face an array of challenges, including tracking down students they can't see. On a recent weekday, Good tried to connect with roughly a fifth of her students who, more than a week into the spring semester, had yet to log on for her class. Good has never met most of them and likely never will. A little after 9:00 a.m., Xavier Long, a student in Good's ninth-grade Earth science class, calls. Xavier, who's never taken an online course before, is confused. Good goes over the assignments for the week, explains how to submit work and then guides Xavier through downloading a plug-in tool that takes screenshots of his desktop and documents his work. Good finds time in the same day to reach out to over 20 students and almost a dozen parents. She spends a half-hour helping a father who's having difficulty helping his son access Blackboard, the learning management software used by the 21st Century Virtual Academy. "Parents are much more involved in some ways online," Good says. "They are literally in my classroom if they want to be, which creates a lot of that 'Why did you do this this way?'" The 21st Century Virtual Academy, run by the suburban JeffCo district of about 86,000 students, is Good's second foray into online teaching. After a decade in the classroom as a high-school science teacher, she took a job in 2003 at Colorado Virtual Academy (COVA), a nonprofit cyber charter school managed by K12 Inc., a Virginia-based for-profit company that is the largest operator of online schools in the United States. She hoped the move would allow her to spend more time at home with her children, Keegan, now 17, and Delaney, 12. Most of COVA's training for virtual teachers focused on how to keep students enrolled rather than on how to teach them. Good left after two years. "I didn't feel like a teacher," she says. "I was basically a data-entry person." COVA's head of school, Heidi Heineke-Magri, says the role of online teachers has evolved since Good's experience, and teachers now spend a lot more time on instruction, along with preparing lessons, grading work and speaking with students and parents. Good found herself back in a classroom again after her COVA experience, teaching science to at-risk high-school students. But after budget cuts eliminated her position, she moved back online to her current job with the JeffCo Virtual Academy and found herself facing another steep learning curve. "I was in tears every day at the beginning because I didn't have all the training," Good says, articulating a common problem for virtual teachers. Only 25 percent of teachers nationwide who were surveyed for "Going Virtual! 2010," a study by researchers at Boise State University, said they received training geared specifically to online instruction before beginning their work. Over her three years at the JeffCo Virtual Academy, Good has received training and grown much more comfortable teaching online. Monthly professional development meetings, combined with learning from experience, have helped her better guide students and use technology to support them.